The ancient art of Reiki has the power to heal our minds, bodies and spirits in ways few of us can imagine. 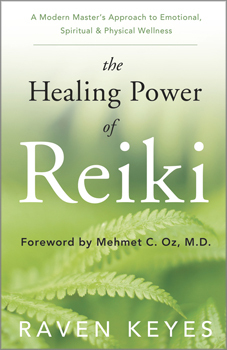 The first Reiki Master to practice in an operating room under the supervision of Dr. Mehmet Oz, author Raven Keyes has brought Reiki to the defining events of our time. With engaging prose, Keyes tells moving stories of giving Reiki to rescue workers at Ground Zero, PTSD survivors, professional athletes, trauma patients, and those suffering from crippling emotional pain. Keyes offers inspirational experiences of connecting with angels and spirit guides, and shares the joys and pains of working with patients, their loved ones, and their communities. Through stories and meditations, readers are filled with hope and a sense of good will. Helpful exercises and meditations are included to invite healing and provide the opportunity to engage with Reiki energy more deeply.